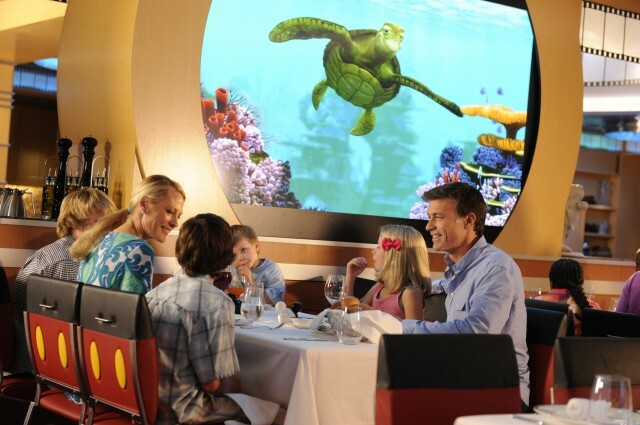 Animator’s Palate is just one of the exciting dining experiences available with Disney Cruise Line. One of the most unique dining features aboard Disney Cruise Line is rotational dining, where your waitstaff moves with you to each restaurant so that they get to know your family during your vacation. The recently re-imagined Disney Magic’s Animator’s Palate now has a brand new “Drawn to Magic” show that surrounds its guests in the swirling colors of animated classics and transforms their dining experience into a dramatic story of heroes and villains. Animator’s Palate is cloaked from floor to ceiling in a classical black and white motif, celebrating the early days of animation in the Steamboat Willie era of Disney’s animation past. There are over-sized digital canvases lining the walls of Animator’s Palate, where unseen artists sketch character portraits in real-time as guests find their tables and make their dinner selections. The whole family is sure to enjoy guessing which favorite Disney characters are being sketched, as their favorite heroes and villains begin to appear on the walls of the restaurant. As appetizers begins to arrive, pencil tests of Disney characters are displayed throughout Animator’s Palate. Iconic moments from Disney favorites like Beauty and the Best or The Princess and the Frog are brought to life, one canvas at a time. Guests then get their first taste of color when the character pencil tests around the room are treated to ink and paint. Each of the characters are shown throughout the painting process of animation, highlighting both the traditional cel painting and modern digital art, which offers a unique look into the animation behind some of Disney’s most adored feature films. Pixie dust heralds the final element of animation, completing the arc from sketch, to pencil test, to ink and paint, leading to the result—storytelling. As dinner begins to wind down and desserts are selected, a grand “Drawn to Magic” finale begins, immersing guests in an animated show about a hero’s journey through Disney and Pixar animation from wishing upon a star to happily ever after. “The tale begins as the room darkens so that the illuminated digital canvases can tell the story of dreams, featuring iconic wishing moments from films like Tangled, The Princess and the Frog, Aladdin, Sleeping Beauty and more. “When You Wish Upon a Star” tugs at heartstrings, as guests reminisce with the characters, of dreams and wishes. The arrival of the Blue Fairy from the classic feature film Pinocchio, brings hope—and a dash of magic—to these stories, imparting a rich splash of color to the walls of Animator’s Palate, for the first time. With their dreams coming true, characters like Cinderella, Merida, Peter Pan and more show guests how animation can tell a story of beauty, hope, magic and wonder. Guests soar through the clouds with Aladdin and Jasmine, tumble to Wonderland with Alice and explore a new world with Ariel. The storytelling continues as the walls shift to a lighter, golden color with clips of lovable Disney characters featuring some of their most memorable, humorous and endearing moments. As the stories continue and become more intense, the room melds into more colors, bringing new life to the stories. The show takes a dramatic turn when these fanciful dreams are interrupted by fearsome Disney villains—from Maleficent to Jafar—drenching the entire room in a deep crimson red for the first time during the show. This dramatic shift in the lighting plunges guests into the story as characters, taking them on a fearful journey of darkness and despair, finally halting when the protagonists have been overcome. Wearied and worn, the canvases return to their normal state, and the walls become a pale washed-out color—our heroes have been defeated, and hope seems lost. As with happy endings though, magic, faith—and a little bit of pixie dust—raises our heroes (and guests), proving that dreams and hope prevail. Scenes from classic and modern Disney films play on canvases around the room, as the walls flash with moving watercolor medleys, bathing the black and white room in full color. The celebration comes to life, with a parade of color and “transformed” wait staff, led by Sorcerer Mickey, who knows more than anyone, that wishing and dreams can change everything. As a fresh take on the beloved dinner celebration, the new “Drawn to Magic” show appears on the Disney Magic on three-, four- and five-night itineraries. Guests on voyages of seven nights or more are treated to both “Drawn to Magic” and “Animation Magic” shows. This entry was posted in Cruises, Disney and tagged Animator's Palate, Disney Cruise Line, Disney Magic, Drawn to Magic on May 31, 2014 by siera.